A programme of free walks led by expert guides is set to get Farnham active while helping people discover more about their surroundings. 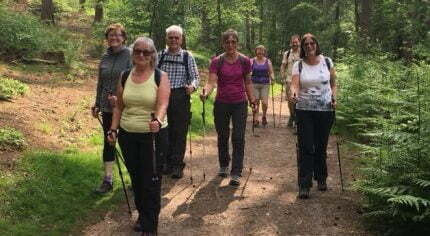 The 2019 Farnham Walking Festival, which has been organised by Farnham Town Council and is run by volunteers, includes routes suitable for all abilities – including some that are wheelchair friendly – and are themed around wildlife, archaeology and local heritage. Inspiration for the festival, which is now in its third year came from Chris Shepheard who says: “We want our festival to appeal to all parts of our community and be accessible to all, regardless of abilities. If you already enjoy great fitness then our more strenuous walks of up to 14 miles will appeal to you but we have several strolls of just a mile or two on very gentle terrain that will be perfect for people who find exercise more of a challenge. There are also plenty of walks in between. Copies of the free guide are available from the Town Council, libraries and other community outlets and can be downloaded from www.farnham.gov.uk. With almost 40 walks taking place over the duration of the festival, the organisers hope that residents of all ages and interests will find something to enjoy. Iain Lynch, the Town Clerk at Farnham Town Council says: “We are very grateful to our Gold sponsor Abbeyfield Wey Valley Society and to all our volunteer walking leaders for giving up their time to plan and guide the walks. This support means we can keep the walks free and spread the programme across weekends and weekdays, daytime and evenings to work around residents’ free time. Our thanks also go to the Wrecclesham Co-op (part of the Southern Co-operative group) and their ‘Love your Neighbourhood’ scheme for their support which encourages positivity in local communities. The festival starts on Sunday 19 May and continues until Sunday 2 June. Each walk is led by an expert in their field. To join a walk, simply choose one or more walks from the guide and book for free at www.farnhamwalkingfestival.org. Walking leaders recommend wearing comfortable clothing and suitable footwear. The organisers, Farnham Town Council, have enlisted local groups including Farnham District Ramblers, Friends of Farnham Park and Bourne Conservation Group to lead the walks.